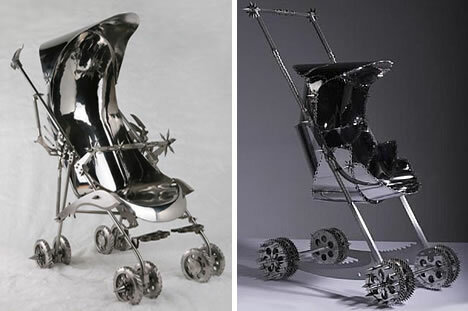 Chinese artist Shi Jinsong created sculptures depicting baby accessories which would fit right in as toys for the Addams Family or for a future Terminator baby. 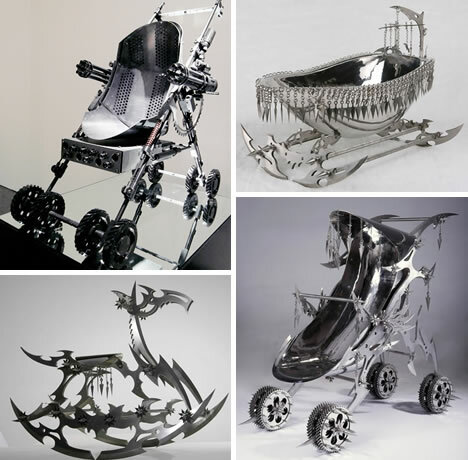 Strollers, cribs, rattles, and walkers are made from razor-sharp blades, making a macabre and bizarre fine art collection. 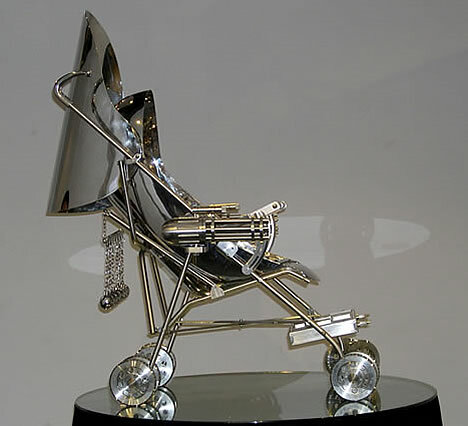 Here are some of the most bizarre baby items and other wicked stainless steel blade sculptures you may ever see. Once upon a time, in Buddhist Chinese mythology, there was a very naughty but very clever child called Na Zha. He was the “enfant terrible” and had a militaristic tendency for wreaking violence. Na Zha, who is the Trickster God Boy of Childish Pranks and Tantrums, had three heads, nine eyes and eight arms. Artist Shi Jinsong reinvented Na Zha as the “new face of Mothercare with a range of deadly baby products.” Above are a couple of sinister Walkers for the baby, fashioned out of razor-sharp blades. 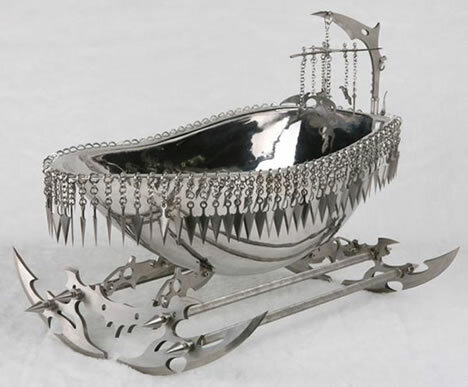 Na Zha Baby Boutique exhibition included this sadistic Cradle that is perfect for child with supernatural powers. 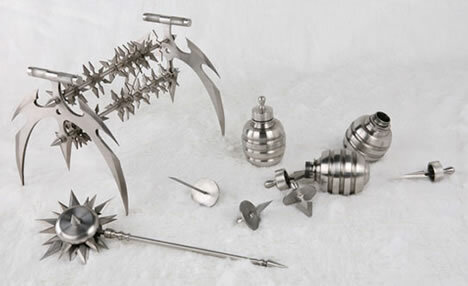 Deadly sharp blades and gleaming stainless steel offer lethal luxury in this outrageouly unsafe line of baby products. In the case of Na Zha, this would work well for him as he is now mostly known as the God of Lotteries and Gambling. Like all babies, Na Zha needed toys. The Baby Boutique includes needle-tipped pacifiers, a rattle made of razors, and a dismembering abacus. 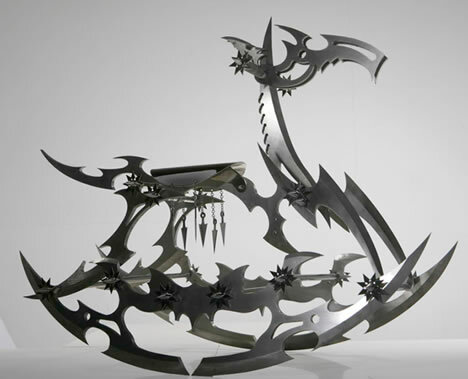 Also included in Shi Jinsong’s collection are a stainless steel rocking horse and a knife-edged trike. 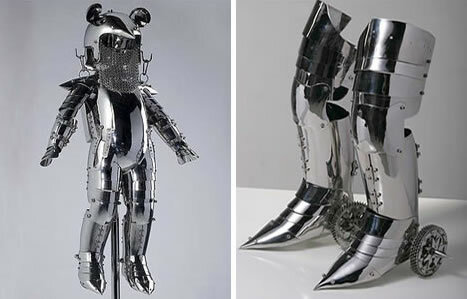 Na Zha wears a suit of armor, but ironically the child’s suit comes complete with mouse ears. The boots are roller blades as this mythological child had wheeled fiery feet and would possess all kinds of malicious toys and powerful weapons. Na Zha Baby Boutique had several types of strollers with a twist of mythic Chinese culture and modern-day globalization. 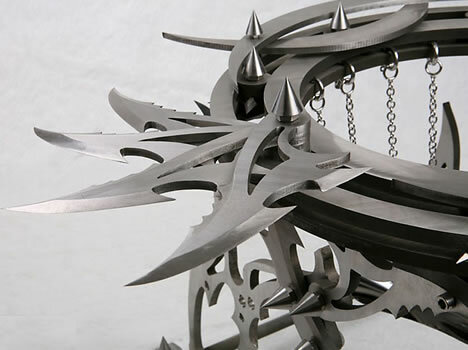 If these sculptures were actually used, the pointy stakes on the wheels would surely cut a path through the crowd. They are epically bizarre yet tremendously fascinating, form and function, fearsome to behold. 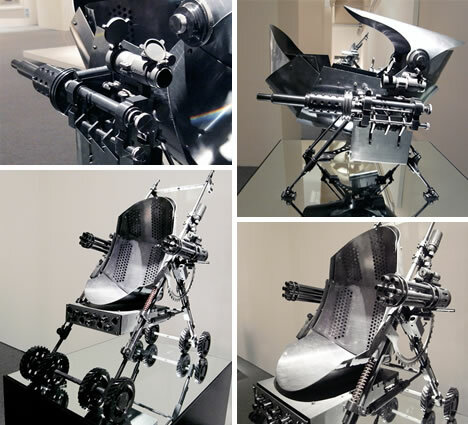 If Sarah Connor could have, she would have no doubt used this stroller for John. 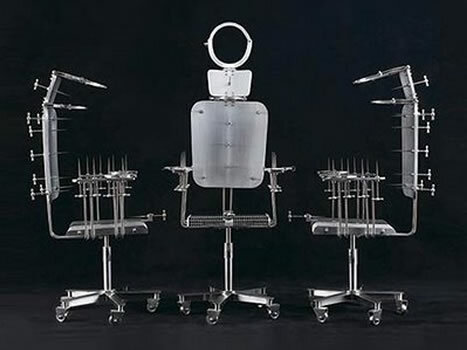 Indeed, this would be the perfect gift for any future Terminator baby. 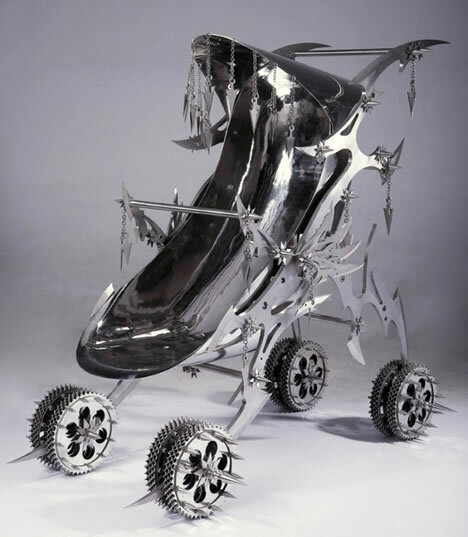 Part stroller and part armored tank, it’s for either that very protective parent or killer baby wishing for the ultimate deadly weapon to tote along on those mid-morning walks. Shi Jinsong creates more than a lethal luxury line of baby products. 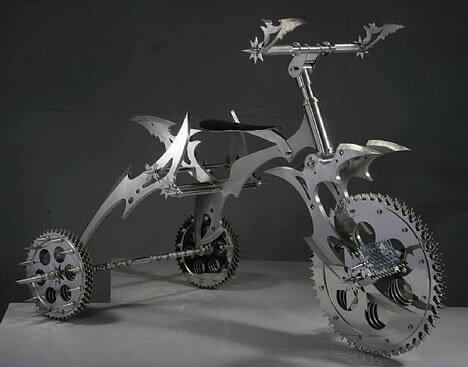 He also wields stainless steel blades in razor-sharp bikes for big kids. “The sculptural installation Halong-Kellong is the imagined self-projection of modern life from a Chinese peasant’s perspective.” Hand trucks are common in China’s rural villages. 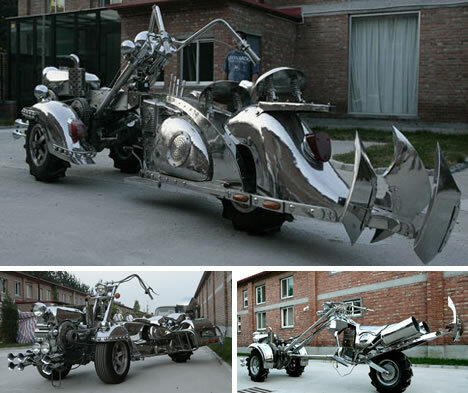 These three hand trucks have a Harley-Davidson style logo, since Harleys were once known as a “prince’ s chariot, often ridden by the most badass characters in American movies.” These are definitely badass bikes. 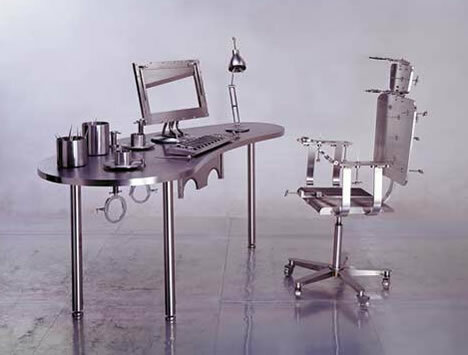 If you think it’s torture to sit at your computer desk and work, then perhaps you should take a long look at Shi Jinsong’s “Office Equipment-Prototype No 1.” Jinsong meant it as a metaphor on “oppressive authoritarianism—high tech going to harrowing extreme.” Or maybe you are in the market for a new computer chair? The three in the bottom photo would forever change a desk jockey’s job into true torment. 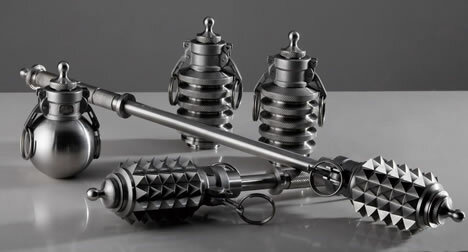 Although Shi Jinsong is predominantly known for his pristine stainless steel sculptures of baby products, he also produced a Secret Book of Cool Weapons theme. 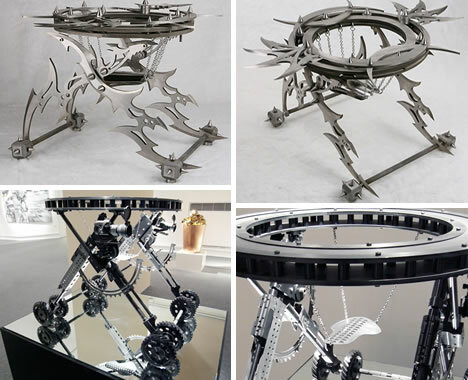 In the Secret Book of Cool Weapons, Jinsong portrayed corporate logos such as Mercedes Benz, Nike, and others as ancient, powerful weapons in corporate battles.